mylocalstore has no other items for sale. I really like the product despite that it's a lot thinner gauge weave, BUT, at 1/4 the price of normal fencing, I couldn't be happier!!!!! At first I was not happy, UNTIL I got out there and used the fencing. I was quite amazed at how much easier it was to put up than the heavier gauge fence and it's actually as strong as the heavier one. I Will Purchase this product in the future for sure. Still wish it was just a little heavier gauge, because it is almost invisible once it is in place. Had a bird trying to hop through it and had to help him get out. Thx, Mike M.
Old Review: It's not so thin and flimsy that it snags every leaf and twig like some nettings I've reviewed, but it did snag on my shoes a lot which was quite frustrating since it's nearly invisible even at close range. For example, cats can't tell it's there until they run into it. It would cost the manufacturer a negligible amount to make it thicker, both so it can be seen and for strength, which is questionable. 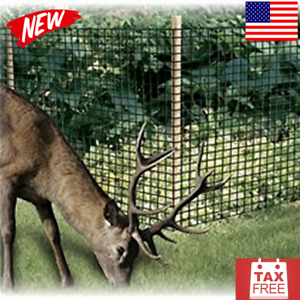 It's surprisingly strong for what it is, but I'm guessing a deer could step right through it depending how determined the deer is and whether the deer gets tangled in the fencing from not seeing it. I haven't owned the fencing long enough to say for sure, but my confidence is borderline and if it were a bit thicker, I'd be the biggest cheerleader for the product. There is a money back guarantee, but it's so cheap that I can't imagine most folks would bother. Honestly, I'm not sure how to rate the fencing. I suppose it depends on the intended use. For what it is, it is made well and it's inexpensive, so I hate to be overly harsh and at the moment, I have no evidence that it doesn't work as advertised. But, I've seen deer tear up stronger things, so we'll see. UPDATE: Do not buy! It's useless garbage that was ripped to shreds and is now a giant mess I have to dispose of. It should be illegal to have "deer" on the package as rabbit is probably the biggest animal this could contain. Don't waste your money trying to save money. easy to work with does a good job of keeping the birds out of my straw berries. Works great for covering bushes. Put in some tall stakes and run strings across and lay the netting over the top and sides.